This project is finished, you can read the final report here. Chronic diseases are a serious and increasing problem. The associated economic burden not only affects individuals and the health system, it also adversely affects workplace productivity, economic growth and participation across the full range of domestic and workplace activities. Fortunately, many major chronic diseases are largely preventable through changes to key risk factors: poor diet, physical inactivity, tobacco use, harmful alcohol consumption and obesity. Despite the burden of lifestyle-related chronic disease and the opportunities for prevention, only a small percentage of Australian government budgets for health care is spent on prevention. Develop and make readily available innovative, accessible and compelling messaging about the value of reducing preventable chronic disease. Literature review and data collation – The project team collated evidence about the health and economic burden of chronic disease, its preventability and the economic credentials for action. The literature review covered both methodology and empirical results. Dynamic simulation modelling – Dynamic simulation modelling is a tool that enables policy makers to test the likely impact of a range of possible policy solutions in computer models before implementing them in the real world. 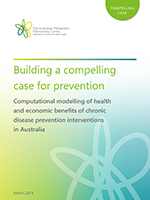 The project developed a dynamic simulation model to demonstrate the value of prevention to reduce lifestyle-related chronic diseases, and the associated impact on the costs of health service use and the increase in health and wellbeing in Australia. The model integrated evidence about the effectiveness and cost-effectiveness of prevention interventions and strategies, with expert opinion to develop the models. Communications – The team also developed innovative and accessible resources to communicate the model outputs. 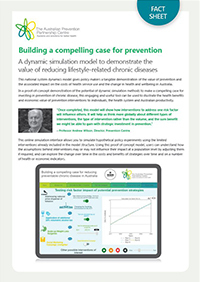 A proof-of-concept demonstration of the potential of dynamic simulation methods to make a compelling case for investing in prevention of chronic disease, this engaging and useful tool can be used to illustrate the health benefits and economic value of prevention interventions to individuals, the health system and Australian productivity. This online simulation interface allows you to simulate hypothetical policy experiments using the limited interventions already included in the model structure. Readiness to respond at short notice to requests for evidence about the economics of prevention. Although we can forecast the health burden of chronic diseases and the impact of individual risk factors, existing modelling does not consider what happens in the real world – for example, how interventions work in combination, or how people live with multiple risky behaviours that jointly influence the same preventable chronic disease. Using the proof-of-concept model, users can understand how the assumptions behind interventions may or may not influence their impact at a population level by adjusting them if required, and can explore the change over time in the costs and benefits of strategies over time and on a number of health or economic indicators. Prevention Centre policy partners are invited to engage with our online simulation interface to simulate policy experiments. The next phase of the project is to develop the proof-of-concept model into a robust decision-support tool for policy makers. Note that the model requires further development before it is suitable for informing investment decisions. An initial online simulation interface has been developed as a proof-of-concept to allow Prevention Centre policy partners to simulate policy experiments using the limited interventions already included in the model structure. Users of the interface are able to understand the assumptions behind these interventions, adjust them if required, and explore the costs and benefits of the impact of these strategies over time and on a number of health or economic indicators. This system dynamics model represents a significant advancement in conceptualisation and scope with respect to previous single risk factor population and burden models. The project has enabled the Prevention Centre to establish that the system dynamics of preventable chronic disease burden can be modelled. Prior to this model only individual risk factors and several outcomes of interest had been successfully modelled using system dynamic techniques in the health policy sphere in Australia. It is important to note that the model is still a work-in-progress and should not be used to inform investment decisions. However, the Prevention Centre has refunded the project to expand the scope of the model until November 2020. Read more about the second phase of the project here. Davison J. Building a Compelling Case for Prevention. PHAA Prevention Conference, Satellite Event. Simulation Modelling in Health Symposium. 4 May 2018.